A rugged hard drive can withstand bumps and drops, providing excellent physical protection of your stored data. Some hard drives also have password features to ensure complete data security. LaCie portable hard drives are slim and lightweight, for easy everyday carry. 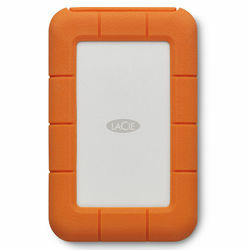 Why Choose LaCie Rugged Hard Drives? For maximum productivity, don't forget to shop for accessories such as USB cables that enable you to connect your hard drive to a USB-ready device. If you're planning to review or shoot 4K or 5K videos, you may want to consider large solid state drives (SSD) to store your data. They'll help to extend the life of your laptop or desktop PC with faster boot-ups, shutdowns, and app response times. Are Rugged Hard Drives Right for Me? While they're often associated with construction work, installation services, and other professions that are known for beating up equipment, rugged hard drives can be lifesavers for photographers, students, and anyone else who takes their data or collects it on the go. If you can foresee any circumstance where your hard drive might be dropped, stepped on, or exposed to the elements?whether in an office or in the great outdoors?protect your photos, videos, and other data by investing in a unit that's designed to withstand the bumps of going where you go. Browse B&H Photo and Video's wide selection of LaCie hard drives, arrays, and accessories to find the right product for your needs. You can also learn more about whether rugged hard drives are tough enough for what you might put them through, by checking out our blog.